For most of this year almost every Pens fan hating on Tyler Kennedy assumed that TK would not be a part of the Pens after this year. Kennedy's two-year, $2 million per year contract expires after this year. Since Kennedy has not played in the NHL long enough to become an unrestricted free agent, he will become a restricted free agent after this year. In order for the Pens to maintain his rights, they would have to make a qualifying offer equal to his salary this year. That would be a $2 million offer by the Penguins. Even the most ardent TK fans - myself included - believed that was highly unlikely: given next year's salary cap, the need to re-sign Dupuis, and the need to extend Malkin and Letang. Indeed, at the trading deadline, I thought a team like Winnipeg that was still in the playoff hunt and in need of a scoring winger should make a play for TK. I don't want to see TK leave Pittsburgh, but I try to deal in reality. That reality was that based on Kennedy's regular season numbers this year (6 G, 5 A, 11 Pts, -6) and recognizing that it would be hard to justify shelling out a qualifying offer of $2 million/year for a player with those numbers. Like the phoenix rising from the ashes, however, Kennedy's post-season play has resurrected TK's reputation. The bigger question is whether it has resurrected a future here as a Penguin. Iginla, Morrow, Cooke and Adams are all unrestricted free agents next year and I can envision a scenario where none of those 4 return. Dupuis is also an unrestricted free agent, but I got to believe that re-signing him will be a top priority for Shero. Kunitz and Dupuis on Crosby's wings, and Neal and Bennett on Malkin's wings seem like a good bet for the 2013-2014 season. 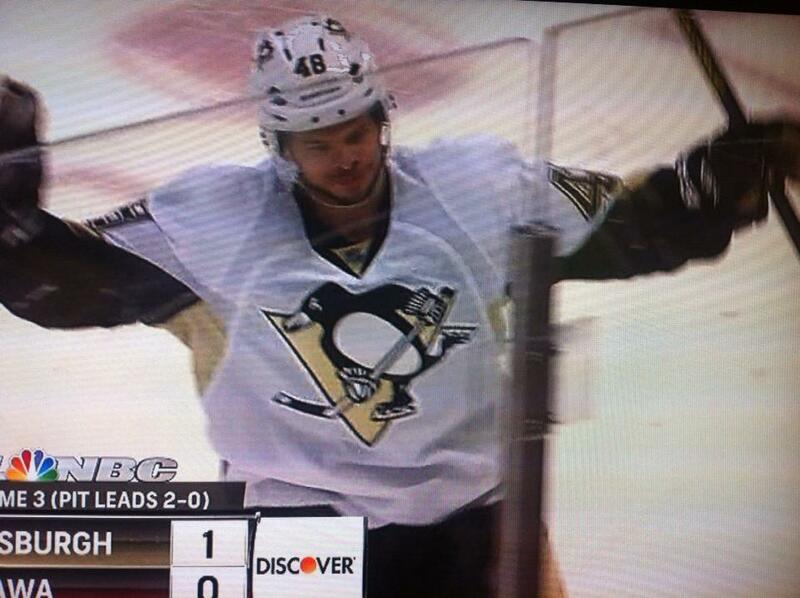 But who will be on Sutter's wings on the 3rd line if Morrow and Cooke are both gone? Could it be TK? I still think that its more likely than not that TK ends up playing somewhere else next year and that Shero will likely believe that he can find value on the 3rd line that doesn't cost $2 million a year. However, the decision to part ways with TK - a decision that seemed like an easy one just a couple of weeks ago - has likely gotten more difficult for Shero and company. For all of those TK haters hoping that this was the last year they would have to see him in a Pens jersey, he might just be playing his way back for another year.